I spied these four beautiful china plates at a garage sale, and knew I could find a use for them somewhere; they were just too pretty to leave behind. 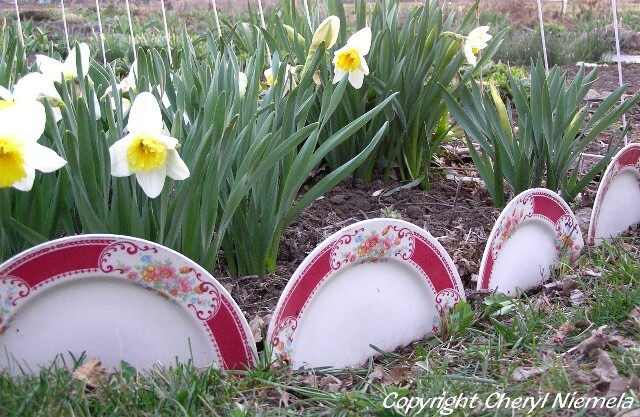 Here they are in the garden, and I love the idea that I am using my china everyday, not just for company. It couldn’t have been easier putting these in; dig a trench, then ‘plant’ the plates, and fill in the trench. What other fun garden borders have you seen or put in? This is such a creative idea! Well done!! I have seen one made of wine bottles a few times, but I just love the plates! I can just see a fairy tale cottage close by! Pretty plates! Great idea. I have been pondering something to do for my flowerbed garden vs. the traditional stuff you always see…. Will have to check out some garage sales and see if any plates catch my eye! I don’t think I’ve seen one as creative or pretty before. I like it. Love that idea! They are so pretty!